Virtual reality headsets aren't new, but they may be something you or someone on your holiday shopping list hasn't experienced yet. If you're going to dive into the world of smartphone-based virtual reality, the best time to do it is during Black Friday when all the good sales are going on. We've rounded up what little VR headset deals we could find for Black Thursday (aka Thanksgiving) and Black Friday weekend below. For all of these headsets, all you need is your smartphone, and the VR headset should come with everything else you need. Smartphone-based virtual reality headsets allow you to enjoy videos, movies, games, travel, and more without interaction with the outside physical world. They are much cheaper than their computer-based headsets like Oculus Rift and HTC Vive, which require a lot of computing power. 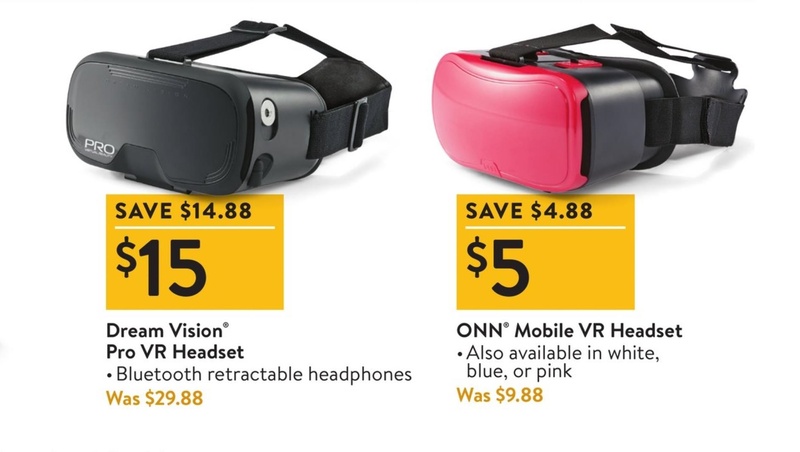 Target has a good deal for anyone looking for a smartphone VR headset this Black Friday. The retailer features the Utopia 360 Pro Series VR headset for $29.99, saving you an even $30. In the fine print, however, Target says all VR headsets are on sale, so if you don't like the Utopia 360 Pro's huge headphones, you've got more choices. Sales are good Nov. 23–Nov. 25. Best Buy also carries a Utopia VR headset, but not the same as Target. The pair Best Buy offers does not come with built-in headphones, but it does cost half that of Target's headset. Also on the savings docket is the Samsung Gear VR. If you purchase this headset (it must be the one with a controller) with the Gear 360 camera, you can get both for $200, saving $160. Sales are good Nov. 23–Nov. 25. Amazon has a couple of headsets deals this Black Friday, however, they're a little complicated. The deals fall under a "Buy 1, get a discount on select products" promotion, where you must purchase a second item to get a discount on either the VR headset or the second item. To complete the promotion, make sure to tap "Add Both to Cart" under the "Buy 1, get a discount on select products" link. Walmart also has a few deals on virtual reality headsets for smartphones. You can either save $14.88 off a Dream Vision Pro headset or $4.88 off an ONN Mobile headset. Sales are good Nov. 23–Nov. 24.